Skin cancers include melanoma, basal cell, and squamous cell. Basal and squamous cell are common and treatment is very effective. Malignant melanoma can be difficult to treat. Early diagnosis and treatment can increase the survival rate from melanoma. Most often develops on skin exposed to the sun. But this common form of cancer can also occur on areas of your skin not ordinarily exposed to sunlight. You can reduce your risk of skin cancer by limiting or avoiding exposure to ultraviolet (UV) radiation. Checking your skin for suspicious changes can help detect skin cancer at its earliest stages. Early detection of skin cancer gives you the greatest chance for successful skin cancer treatment. Skin cancer develops primarily on areas of sun-exposed skin, including the scalp, face, lips, ears, neck, chest, arms and hands, and on the legs in women. But it can also form on areas that rarely see the light of day your palms, beneath your fingernails or toenails, and your genital area. Skin cancer affects people of all skin tones, including those with darker complexions. When melanoma occurs in people with dark skin tones, it’s more likely to occur in areas not normally exposed to the sun. Kaposi sarcoma. 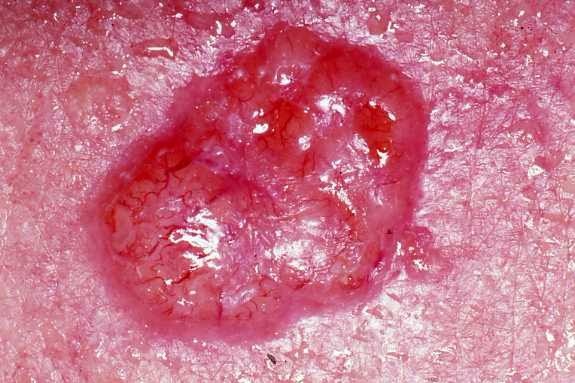 This rare form of skin cancer develops in the skin’s blood vessels and causes red or purple patches on the skin or mucous membranes. Kaposi sarcoma mainly occurs in people with weakened immune systems, such as people with AIDS, and in people taking medications that suppress their natural immunity, such as people who’ve undergone organ transplants. Other people with an increased risk of Kaposi sarcoma include young men living in Africa or older men of Italian or Eastern European Jewish heritage. Merkel cell carcinoma. Merkel cell carcinoma causes firm, shiny nodules that occur on or just beneath the skin and in hair follicles. Merkel cell carcinoma is most often found on the head, neck and trunk. Sebaceous gland carcinoma. This uncommon and aggressive cancer originates in the oil glands in the skin. 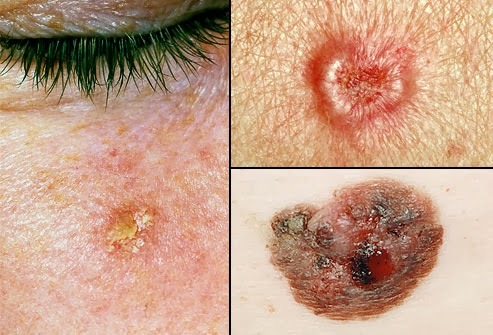 Sebaceous gland carcinomas which usually appear as hard, painless nodules can develop anywhere, but most occur on the eyelid, where they’re frequently mistaken for other eyelid problems. Skin cancer occurs when errors (mutations) occur in the DNA of skin cells. The mutations cause the cells to grow out of control and form a mass of cancer cells. Cells involved in skin cancer Skin cancer begins in your skin’s top layer the epidermis. The epidermis is a thin layer that provides a protective cover of skin cells that your body continually sheds. Squamous cells lie just below the outer surface and function as the skin’s inner lining. Basal cells, which produce new skin cells, sit beneath the squamous cells. Melanocytes which produce melanin, the pigment that gives skin its normal color are located in the lower part of your epidermis. Melanocytes produce more melanin when you’re in the sun to help protect the deeper layers of your skin. Much of the damage to DNA in skin cells results from ultraviolet (UV) radiation found in sunlight and in the lights used in tanning beds. But sun exposure doesn’t explain skin cancers that develop on skin not ordinarily exposed to sunlight. This indicates that other factors may contribute to your risk of skin cancer, such as being exposed to toxic substances or having a condition that weakens your immune. Fair skin. Anyone, regardless of skin color, can get skin cancer. However, having less pigment (melanin) in your skin provides less protection from damaging UV radiation. If you have blond or red hair and light-colored eyes, and you freckle or sunburn easily, you’re much more likely to develop skin cancer than is a person with darker skin. A history of sunburns. Having had one or more blistering sunburns as a child or teenager increases your risk of developing skin cancer as an adult. Sunburns in adulthood also are a risk factor. Excessive sun exposure. Anyone who spends considerable time in the sun may develop skin cancer, especially if the skin isn’t protected by sunscreen or clothing. Tanning, including exposure to tanning lamps and beds, also puts you at risk. A tan is your skin’s injury response to excessive UV radiation. Sunny or high-altitude climates. People who live in sunny, warm climates are exposed to more sunlight than are people who live in colder climates. Living at higher elevations, where the sunlight is strongest, also exposes you to more radiation. Moles. People who have many moles or abnormal moles called dysplastic nevi are at increased risk of skin cancer. These abnormal moles which look irregular and are generally larger than normal moles are more likely than others to become cancerous. If you have a history of abnormal moles, watch them regularly for changes. 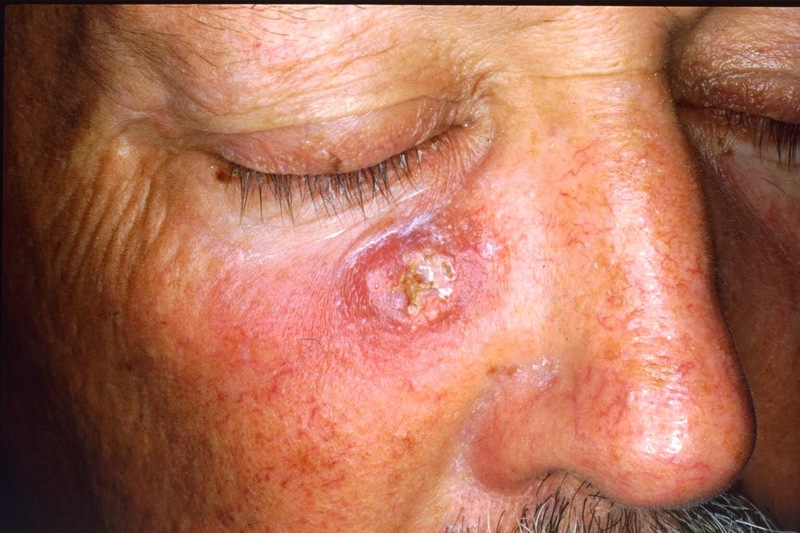 Precancerous skin lesions. Having skin lesions known as actinic keratoses can increase your risk of developing skin cancer. These precancerous skin growths typically appear as rough, scaly patches that range in color from brown to dark pink. They’re most common on the face, head and hands of fair-skinned people whose skin has been sun damaged. A family history of skin cancer. If one of your parents or a sibling has had skin cancer, you may have an increased risk of the disease. A personal history of skin cancer. If you developed skin cancer once, you’re at risk of developing it again. A weakened immune system. People with weakened immune systems have a greater risk of developing skin cancer. This includes people living with HIV/AIDS and those taking immunosuppressant drugs after an organ transplant. Exposure to radiation. People who received radiation treatment for skin conditions such as eczema and acne may have an increased risk of skin cancer, particularly basal cell carcinoma. Exposure to certain substances. Exposure to certain substances, such as arsenic, may increase your risk of skin cancer. Thanks , I've just been searching for info about this topic for a while and yours is the best I've found out so far. However, what in regards to the conclusion? Are you certain concerning the source?